This video was produced with the help of the University of Oxford's Department of Engineering Science, the Nuffield Department of Orthopaedics, Rheumatology and Musculoskeletal Sciences and the Nuffield Orthopaedic Centre. The bookshelves in John O'Connor's home creak under the weight of his passions - engineering, classical music, orthopaedics and Irish literature. A few even bear his name. For a man who could apply his intellect to almost anything, one thing stands out - the Oxford Knee. In 1966, Professor John O'Connor was a lecturer of Engineering Science at the University of Oxford seeking funding for structural joint research - the kind of joints you might find on an aeroplane. But misinterpretation of his intentions led to a chance encounter with Mr John Goodfellow, an orthopaedic surgeon and researcher at the Nuffield Orthopaedic Centre. "Our collaboration continued right up until John died in 2011," says Professor O'Connor. "In fact the day before he died we met to discuss a paper we had been working on." The two men combined their knowledge of the human body and engineering to work toward something medical science had so far failed to achieve - a reliable, long-lasting knee replacement. "The devices that were available were demonstrating one if not two problems. Either the surfaces wore out very quickly, or the components loosened and fell out - or both," he says. Knee replacements usually work by cementing metal surfaces to the ends of the femoral and tibial bones in the leg and replacing the cartilage with a plastic bearing. The great idea was to make the bearing mobile, not fixed to one of the metal components. The mobile joint retained conformity with both surfaces over the full range of movement, preventing wear. It also allowed the knee joint to twist as well as bend, giving patients a more natural range of movement. Ten years later, the fruits of their labour were realised when the first Oxford Knee was implanted in a patient in June 1976. Crucially, the Oxford Knee would go on to be used exclusively as a partial, or unicompartmental, knee replacement from 1982. In about half of the knees needing replacement the damage is confined to just one part of the knee. The Oxford Knee replaces this part while keeping all normal structures in place and preserving the ligaments. This gives a virtually normal function following surgery and a distinct advantage over total knee replacement. 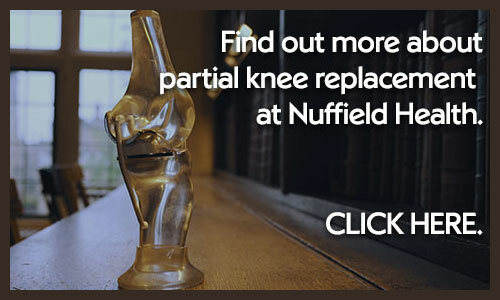 In the early 1990's, Professor David Murray, now a Consultant Orthopaedic Surgeon at Nuffield Health 'The Manor' Hospital, arrived in Oxford to take a position at the Nuffield Orthopaedic Centre soon after John Goodfellow retired. "One of the first things I did was to try and follow up on the patients John Goodfellow had operated on to see if their knees really were as good as everybody said they were. I was somewhat sceptical but I was able to follow up almost all of his patients and their Oxford Knees had done remarkably well," says Professor Murray. But the Oxford Knee was only just beginning to realise its potential. There were a number of innovations yet to come that would improve its results dramatically. In 1998, Professor Murray modified the implants and introduced advanced instrumentation to allow the procedure to be done with a minimally-invasive approach. This added innovation allowed Oxford Knee patients to recover twice as fast as those operated on using a standard open knee procedure, and three times as fast as those with a total knee replacement. In addition, there was less damage to the soft tissues and the functional results also improved. The combination of excellent results and the new minimally-invasive approach stimulated great interest in the Oxford Knee. As a result Professor Murray and his partner Mr Chris Dodd, Consultant Surgeon at Nuffield Health The Manor Hospital and the Nuffield Orthopaedic Centre, started teaching surgeons around the world how to implant the knee. 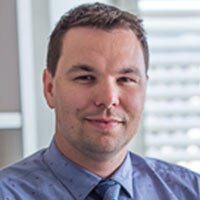 "In the UK today, around 90% of knee patients have total knee replacements. Around half of those patients could have a partial replacement instead, allowing them to recover faster, have a greater range of movement and have less chance of complications after surgery. These advantages are particularly important for young people who want to be very active and for older people who want to minimise the risks of surgery," says Murray. More recently, there have been three further innovations. A set of new instruments were developed to make the operation simpler for surgeons and more reliable for patients. Different implants to suit different parts of the knee were introduced and the metal components that attach to the bone have been adapted to fuse naturally, rather than using cement. These modifications have further improved results and decreased an already low failure rate. "Around 5% of Oxford Knees have poor results or need revision. It's a very low percentage but it keeps me awake at night," says Professor Murray. The continual drive to innovate and improve ever since the first patient received one forty years ago, makes the Oxford Knee one of the great inventions of our time, with its importance recognised by the University of Oxford's 2014 exhibition of Great Medical Discoveries at the Bodleian Library. The popularity of the Oxford Knee has steadily grown among surgeons worldwide. While Professor Murray, Mr Dodd and other knee surgeons in Oxford carry out hundreds of replacements every year, they also spend much of their time travelling to train surgeons around the world in the best techniques for the Oxford Knee. As a result, success rates have steadily improved. Over 650,000 Oxford Knees have now been implanted in patients all over the globe. After 40 years of research and development, the Oxford Knee is like so many of its recipients: only getting better with age and refusing to slow down.